A competitive rower, a commercial captain, a maritime tradeswoman, a lifelong learner, and a cruising author; the women of the 2017 Northwest Women in Boating panel lead inspiring lives both on and off the water. 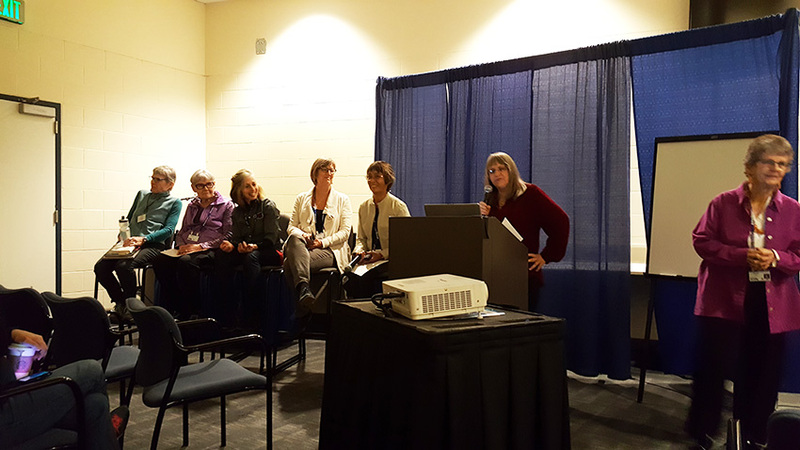 Coinciding with Northwest Women in Boating’s 10th Anniversary, the panel titled “Boating, A Pathway to a More Inspired Life” took place at the Seattle Boat Show, and began with an introduction by volunteer organizer Marilyn Michael. “Boating can be a pathway to advanced education” Michael said, highlighting the benefits of boating including technical learning, fitness, an opportunity to unplug, and it’s potential for promoting equality. Volunteer organizer, Marilyn Michael, introduces the panel. Five speakers each spoke with boldness and confidence about their extensive boating experience. Kicking things off, Marilynn Goo, a competitive rower and member of the Lake Washington Rowing Club spoke about her experience rowing in Seattle since stumbling upon the sport at the University of Washington in 1984. Originally a coxswain, Goo was encouraged to begin rowing by coach and icon Frank Cunningham. In an era when rowing shells were designed for men, Cunningham modified a boat so Goo could begin rowing and she hasn’t stopped since. The first of several sailors, Kam Boule shared her journey from growing up sailing in the Florida sunshine to rediscovering the sailing lifestyle twenty years later. Although she sailed as a child, in college, and eventually on a lake in Colorado, Boule struggled to feel confident and independent on the water. A huge breakthrough came when she started racing with an all-women’s J-24 team. While in Colorado, Boule also began racing on a Hobie 33 as the only female crew member. She had a very positive experience and felt supported and encouraged by her all-male crew. The mountains called her name and kept her mostly on dry land until, years later, Boule rediscovered her love for boating when a two-week cruising trip to Mexico became a month-long voyage. “This has been a very long journey for me but not everyone has to do that. You really learn from others and other people’s encouragement” Boule concluded. Lisa Vizzini, co-owner of Port Townsend Rigging and an outdoor enthusiast continued the theme of encouragement. Feeling confident does not come without some bumps in the road though. Vizzini’s humbling admission tickled the crowd. She also brought attention to the role of Title IX and its impact on the lives of many of the women on stage. Her final piece of advice? Enjoy yourself in the Northwest by dressing correctly! Réanne Hemingway-Douglass spoke next and, as the author of Cape Horn: One Man’s Dream and One Woman’s Nightmare, she had plenty of sailing adventures to share. Hemingway-Douglass’ greatest adventure, by far, was when she and her husband pitch-poled off the coast of Chile as they attempted to sail around Cape Horn. The accident left the boat they owned boat badly damaged and they hobbled to safety on the Chilean coast. Hemingway-Douglass has continued to contribute, especially to the maritime community. She and her husband have explored the entire west coast of North America and published six guidebooks based on their original research. The fifth and final speaker, Captain Debbie Dempsey, spoke with clarity and authority practiced from a career on the bridge. One of the first women admitted to the Maine Maritime Academy, Dempsey recently retired from the elite ranks of the Columbia River Bar Pilots. 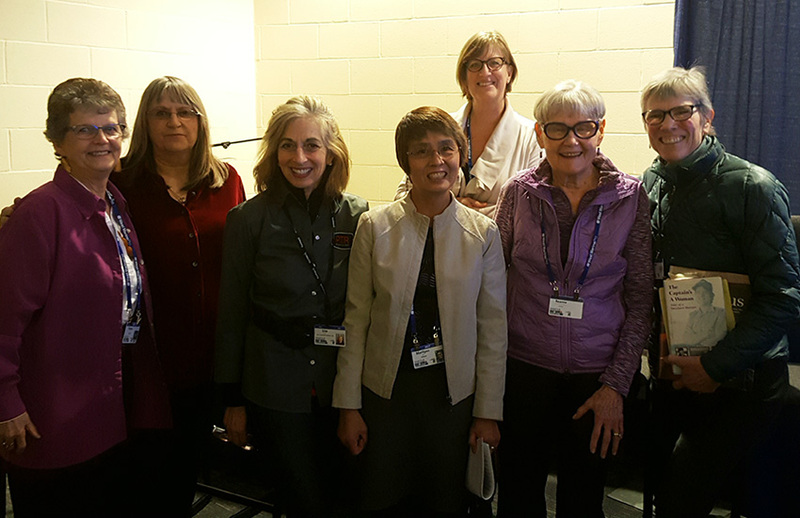 The Women in Boating Panel Presenters (left to right): Vivian Strolis, Marilyn Michael, Lisa Vizzini, Marilynn Goo, Kam Boule, Réanne Hemingway-Douglass, and Captain Debbie Dempsey. Driven by her interest in the maritime trade, Dempsey went on to graduate in just two years at the top of her class. One of only a few students with a job straight out of the academy, her time there was not without challenges. Over the course of her career, Dempsey excelled in the merchant marines, eventually receiving their highest honor. On the decks of giant commercial ships, Dempsey continued learning along the way and navigated ships all around the world. Dempsey’s passion for boating extends beyond the commercial industry and she has sailed and raced throughout her life. Dempsey also helped found the Community Boating Center in Bellingham to help make boating more accessible. She is still a member of their board of directors. After the individual presentations, the panel was asked about encountering discrimination in the maritime community and how women should handle it going forward. A frequent crew, Boule says choosing the right boat and crew is key. “There are some you just don’t want to be around, don’t be around them. There are just as many that encourage you,” she said. The evening concluded with the Northwest Women in Boating’s annual recognition awarded to marine surveyor,Lynne Reister. Organizers Marilyn Michael and Vivian Strolis were surprised with their own plaques, recognizing them for ten years of leadership. More information about the Northwest Women in Boating group and upcoming events can be found at www.nwwb.wordpress.com.